This year will be the first year that Micah and I are able to put up our own Christmas tree. Since this will be our first tree we don't have many decorations for it so to save us money I decided to make all our own decorations this year. I started off by making my favorite Apple Sauce Spiced Ornaments. They are very easy to make and they look and smell beautiful around the house. 1. Combine the dry ingredients and then slowly mix in the apple sauce. 2. Stir with a wooden spoon a couple of times before mixing together with hands (I always where plastic gloves). 3. Form the mixture into a ball shape. 4. Roll the dough out 1/4 inch thickness. The dough is usually very sticky so I like to use wax paper to roll the dough out. I put one sheet on the table and one over the dough to make it easier to roll out. 5. Cut the dough out with your favorite cookie cutters. Its best to use cutters that don't have many little parts that way the dough will not stick in them. I like to do stars, ginger man, Christmas trees and snowmen. 6. Once you have the shapes pressed into the dough I find the easiest way to get them onto the cookie sheet is to lift them up one at time using a spatula. 7. You will want to make a small hole in the ornament before it bakes so you can hang it once its hard. I usually use a small straw to make a hole. Try not to get too close to the ends so the ornament won't break. 8. Bake ornaments on a single layered cookie sheet at 150-200 (depending on your oven) for 2-3 hours. This will be the first Christmas that these ornaments will make it on a tree. In other years I have used them as gift tags for friends and when we lived in our apartment I hang them up over the windows with the Christmas lights. The next on my ornament list was dried fruit. I had done this in our apartment the first year we had lived there as well and they turned out wonderful so I decided to try again. I did apples and oranges. The apples didn't really turn out all that well for me this year but the oranges look wonderful. 1. Slice the apples and oranges width ways, that means you want to lay the fruit on its side so the steam is facing one way and the bottom the other. When you slice the apple like this the core makes a star shape in the center of your dried fruit and the oranges make a lovely pin wheel. 2. For the apples you will want to dip them in a little bit of water that has lemon juice added to it that way the fruit doesn't turn brown before you get them into the oven. 3. Layer the fruit on a cookie sheet. You will want to put a small hole in the fruit before you bake. For the apples you can use the straw but for the oranges I have found that just making a slice with a sharp knife in the flesh part of the orange looks great and if it doesn't take you can slice it again once the fruit is done drying. Bake at 150-200 for 4-5 hours. You may need to bake them longer depending on how juicy they still feel and look. 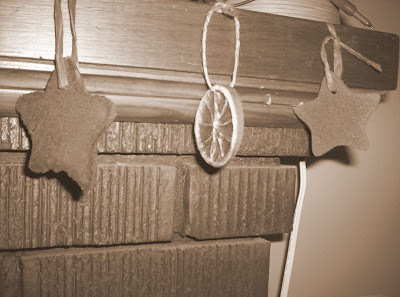 ~ To hang the ornaments I used paper ribbon from the dollar store for the apple sauce ornaments and for the dried fruit I just used a think string like jute. Our tree will be complete with some popcorn garland and red berries. I haven't decided if I will use really cranberries or just some red painted beads. I think the popcorn garland will last longer with out the fresh berries. 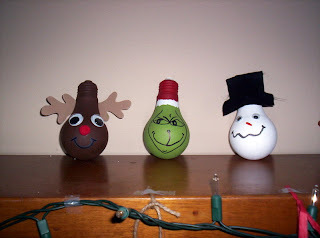 Some other cheap Christmas ornaments that I made where from old light bulbs that had burnt out or that had been replaced by the energy saving bulbs. I painted them with a base color and then decorated them with paint, markers, google eyes and felt. I had seen these ornaments many times at craft fairs so I decided to make my own. I did search the internet first to see many different ideas of how other people made these before I sat down to create my own. Here are my reindeer, Grinch and snowman. These would look great on any tree or would make wonderful Christmas gifts for friends and family members. Ginger bread as always been one of my favorite November treats, since it was what my grandfather always loved to enjoy on his birthday (which was in November). This year I decided to try out my moms famous recipe. The original recipe did call for shortening but I used non-hydrogenated margarine instead. I was doing some research on molasses since the recipe calls for one cup and there are some health benefits. WHfoods states that black strap molasses replenish your iron stores, is a very good source of calcium, an excellent source of copper and manganese and a very good source of potassium and magnesium. In addition to giving gingerbread its dark color and delicious flavor molasses can also be added to bake beans or enjoyed on hot homemade bread, biscuits or rolls. 1. 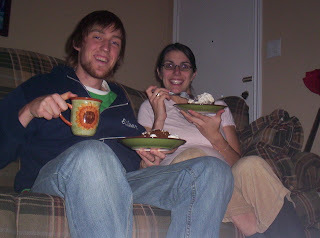 Cream together shortening and brown sugar in large bowl. Add eggs and beat. 2. Combine flour, ginger and cinnamon. 3. Add flour mixture to the egg mixture alternately with molasses. 4. Dissolve soda in boiling water and add to rest of mixture. 5. Put in greased 9x13 pan. Bake at 350 for 40 -45 minutes. 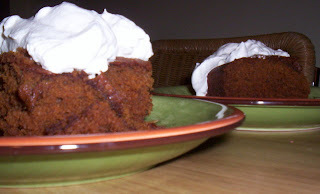 Now the best way to enjoy this cake is with real whipping cream. The best way to make whipping cream is to make sure you put the bowl you are going to whip the cream in in the freezer first. The cream whips up better when the bowl is cold. When making whipping cream you can add sugar to it as you are whipping but we have found that adding maple syrup gives the whip cream an even more delightful taste. These little cookies have become my new craving. They are simple to make and go great with a hot cup of tea. The dough also freezes well, which is great to have on hand for those emergency company visits. The original recipe calls for shortening but I use non-hydrogenated margarine and they turn out just wonderful. ~ If you want to freeze the cookies you can form into balls, roll in sugar, place on cookie sheet and gently press them down with you hands. Then put the cookie sheet into the freezer and let them freeze. 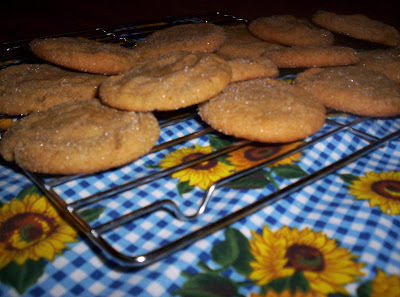 Once cookies are frozen you can transfer them from the cookie sheet into a freezer bag. When you are ready to bake just take them out of freezer, place on cookie sheet and bake at 350 for 8-10 minutes. As some of you may know from reading our other blog (micahandkatie.blogspot.com) Micah and I made a special birthday crown roast for our friend Weiwei's birthday. As you can tell from the picture there is a lot of pork on this thing and since there was only 5 of us for dinner I had to get creative as to what I was going to do with all the left over pork. 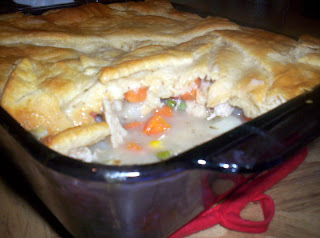 Micah did an excellent job making some pork gravy so I decided to through everything together and make a pork pot pie. I started out by cooking up some potatoes and carrots. As they were cooking I chopped up the pork into bit size pieces. When the vegetables were done cooking I put them into a casserole dish and added some frozen vegetables, the pork and of course my husbands very delicious gravy. 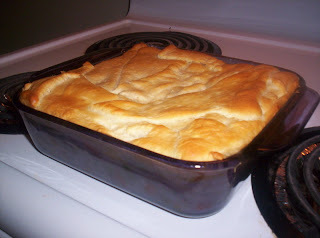 When it was almost supper time I put the casserole into the oven (without the crust) after about 20-30 minutes (or when the inside stuff was hot) I added Pillsbury Crescent Roll dough to the top and baked until the top was done. This was such a quick and easy way to use up left over meats. You could make your own pie crust and put a bottom crust on if you wanted. I think this will be a great recipe for all the left over turkey from Christmas dinner, especially since there will be left over gravy ...well I hope there will be. 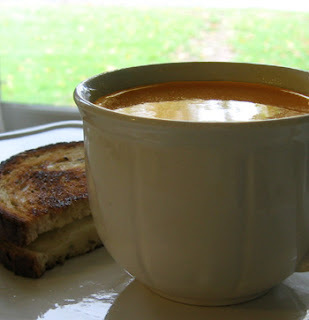 Last year was the first time I started experimenting with pureed soups. I wanted to see if I could make a soup that was just as good as the ones that come from the cartons in the stores without the added fats and preservatives. First I started with squash soup, then carrot and pumpkin. The other night we had some left over squash in the fridge that needed to be used up so I decided to get creative again and see what I could come up with. Its not a recipe but an expression of creativity until you get the right taste. So get creative and start inventing your own soups. 1. Start with a large pot. That is approximately 1/2 full of water. I use the water as the puree juice instead of adding cream or milk. That way the nutrients from the vegetables are not lost. 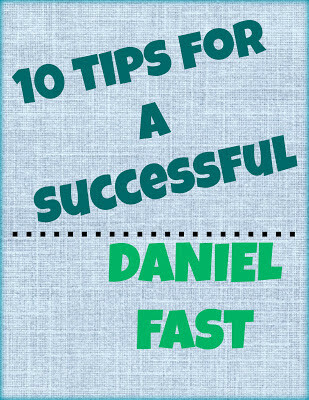 If you have chicken stock that can work just as well. 3. Spice the soup up while boiling with curry powder, cumin, vegetable cube, salt, pepper, cinnamon or any other spice you think would taste delicious. 4. Let mixture boil until vegetables are soft. Since they are going to be pureed you can let them be as soft as you would like. 5. Puree soup. To do this I add a cup or two at a time into my blender with the juice that is still in the pot. I puree for a minute or so then transfer the puree into another pot thats one the stove. I continue to do this until all the soup as been pureed then heat the puree up and spice to taste adding more of the above spices until you reach the taste you desire. Note: I have found that curry and coconut taste great with squash or pumpkin soup while pecans or walnuts give pureed carrot soup a wonderful flavor. I usually do not add the nuts to the soup until the puree process after I have toasted them in a sauce pan to bring out their rich flavor. Let me know of other pureed soups you have tried ( I love to find a good broccoli cheddar soup) or what spices you like to add to your soups.